The 747-8 is offered in two main variants: the 747-8 Intercontinental (747-8I) for passengers and the 747-8 Freighter (747-8F) for cargo. The first 747-8F performed the model's maiden flight on February 8, 2010 with the 747-8 Intercontinental following on March 20, 2011. Delivery of the first freighter aircraft has been postponed multiple times and is now expected in mid-2011; passenger model deliveries are to begin in late 2011 or early 2012. In February 2011, orders for the 747-8 totaled 107, including 74 of the freighter version, and 33 of the passenger version. Boeing had considered larger-capacity versions of the 747 several times during the 1990s and 2000s. The 747-500X and -600X, proposed at the 1996 Farnborough Airshow, would have stretched the 747 and used a 777-derived wing, but did not attract enough interest to enter development. In 2000, Boeing offered the 747X and 747X Stretch derivatives as alternatives to the Airbus A3XX. This was a more modest proposal than the previous -500X and -600X. The 747X would increase the 747's wingspan to 229 ft (69.8 m) by adding a segment at the root. The 747X was to carry 430 passengers up to 8,700 nmi (16,100 km). The 747X Stretch would be extended to 263 ft (80.2 m) long, allowing it to carry 500 passengers up to 7,800 nmi (14,400 km). However, the 747X family was unable to attract enough interest to enter production. Some of the ideas developed for the 747X were used on the 747-400ER. After the 747X program, Boeing continued to study improvements to the 747. The 747-400XQLR (Quiet Long Range) was meant to have an increased range of 7,980 nmi (14,780 km), with better fuel efficiency and reduced noise. Changes studied included raked wingtips similar to those used on the 767-400ER and a sawtooth engine nacelle for noise reduction. Although the 747-400XQLR did not move to production, many of its features were used for the 747 Advanced. In early 2004, Boeing announced tentative plans for the 747 Advanced that were eventually adopted. Similar in nature to the 747X, the stretched 747 Advanced used technology from the Boeing 787 Dreamliner to modernize the design and its systems. On November 14, 2005, Boeing announced that it was launching the 747 Advanced as the "Boeing 747-8". Picture - Artist's rendering of an early version of the passenger 747-8, then known as the 747 Advanced. This had a shorter stretch of 140 in (360 cm), rather than the final 220 in (560 cm). The 747-8 was designed to be the first lengthened 747 to go in to production. The 747-8 and 747SP are the only 747 variants with a fuselage of modified length. The 747-8 was intended to use the same engine and cockpit technology as that of the 787, including the General Electric GEnx turbofan and partial fly-by-wire. Boeing said that the new design would be quieter, more economical, and more environmentally friendly than previous versions of the 747. As a derivative of the already-common 747-400, the 747-8 has the economic benefit of similar training and interchangeable parts. 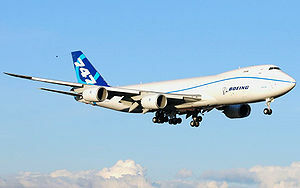 Boeing firmed the 747-8 Freighter's configuration in October 2006. The 747-8, as the current new development of Boeing's largest airliner, is notably in direct competition on long-haul routes with the Airbus A380, a full-length double-deck aircraft now in service. For airlines seeking very large passenger airliners, the two have been pitched as competitors on various occasions. Boeing claims that the 747-8 is more than 10 percent lighter per seat and will consume 11 percent less fuel per passenger than the A380, translating into a trip-cost reduction of 21 percent and a seat-mile cost reduction of over 6 percent. Production of the first 747-8 Freighter began in Everett in early August 2008. On November 14, 2008, Boeing announced a delay to the 747-8 program, citing limited availability of engineering resources within Boeing, design changes, and the recent strike by factory workers. On July 21, 2009, Boeing released a photograph of the first cargo airplane, its fuselage and main wing assembled. In February 2009, only one airline customer (Lufthansa) had ordered the 747-8I passenger model, and Boeing announced it was reassessing the 747-8 project. Chief executive Jim McNerney stated that continuation of the project was not a foregone conclusion. The company was assessing various options. In October 2009, Boeing announced that it had delayed the first flight on the 747-8 until first quarter 2010 and delayed 747-8I delivery. The company took a US$1-billion charge against its earnings for this delay. In response, launch customer Cargolux stated it still intended to take delivery of the thirteen freighters it had ordered; Lufthansa confirmed its commitment to the passenger version. On November 12, 2009, Boeing announced that Cargolux's first airplane was fully assembled and entering the Everett plant's paint shop. It will undergo flight testing prior to delivery. On December 4, 2009, Korean Air became the second airline customer for the -8I passenger model, with an order for five airliners. On January 8, 2010, Guggenheim Aviation Partners (GAP) announced the reduction of its -8F order from four to two aircraft. In March 2011, Korean Air converted options into a firm order for two additional -8 freighters. On April 21, 2010, Boeing chief executive officer Jim McNerney announced that the company would be accelerating the production of both the Boeing 747 and 777 to support increasing customer demand. On September 30, 2010 Boeing announced a further postponement, with the delivery of the first freighter to Cargolux expected in mid-2011. The 747-8's first engine runs were completed in December 2009. Boeing announced the new model had successfully completed high-speed taxi tests on February 7, 2010. On February 8, 2010, after a 2.5-hour weather delay, the 747-8 Freighter made its maiden flight, taking off from Paine Field, Washington at 12:39 PST, and landed at 4:18 pm PST. Boeing estimates that more than 1,600 flight hours will be needed in order to certify the 747-8. The second test flight in late February, a ferry flight to Moses Lake, Washington, tested new navigation equipment. Further flight testing will take place in Moses Lake, conducting initial airworthiness and flutter tests, before moving to Palmdale, California for the majority of flight tests, so as to not interfere with 787 flight tests based out of Boeing Field in Seattle. By March 11, 2010, the 747-8F had flown thirteen flights for a total of 33 hours of flying time. On March 15, 2010, the second 747-8F first flew from Paine Field to Boeing Field, where it will be based for a short time before moving to Palmdale to continue flight testing with the first -8F. On March 17 the third -8F made its first flight and joined the test program. Boeing plans to display the 747-8F at the 2010 Farnborough Airshow, along with the 787, although appearances by both aircraft are contingent on flight testing remaining on schedule. During the flight tests, Boeing discovered a buffet problem with the aircraft, involving turbulence coming off the landing gear doors interfering with the inboard flaps. Boeing undertook an evaluation of the issue, which included devoting the third test aircraft to investigating the problem. The issue was resolved by a design change to the outboard main landing gear doors. In early April 2010, Boeing identified a possible defect in a part at the top of the fuselage called a longeron. According to Boeing, the parts, manufactured by subcontractor Vought Aircraft Industries, are, under certain loads, susceptible to cracking. Boeing said that the issue would not affect flight testing, but other sources stated that the problem could impact the operating envelope of the aircraft until it is fully repaired. Two other problems have been found, with oscillation in the inboard aileron, and a structural flutter, and have not yet been resolved. Combined, these problems have slowed flight testing and used up almost all the margin in Boeing's development schedule. On April 19, 2010, the second flight-test aircraft was moved from Moses Lake to Palmdale to conduct tests on the aircraft's engines in preparation for obtaining a type certification for the aircraft. The remaining aircraft in the test fleet are scheduled to be moved to Palmdale during May. It was reported on June 3, 2010 that an engine on the second 747-8F was struck by a tug during a ground move. The engine cowling was damaged, but there was no damage to the engine itself. After repairs the aircraft is to perform fuel efficiency testing. It was announced on June 14, 2010 that the 747-8 had completed the initial phase of flight-worthiness testing and that the FAA had given Boeing an expanded type inspection authorization for the aircraft. By the end of June 2010, the three 747-8Fs that composed the flight-test program had flown a total of over 500 hours and had completed hot-weather testing in Arizona. 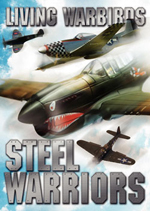 In June 2010, Boeing determined that a fourth -8F aircraft was needed to help complete flight testing. It was decided to use the second production aircraft, RC503, to conduct the non-instrumented or minimally-instrumented tests, such as HIRF and Water Spray Certifications. 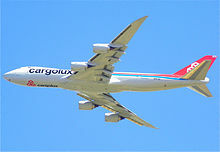 The aircraft, painted in delivery customer Cargolux's new livery, first flew on July 23, 2010. On August 21, 2010, the 747-8F proved its capability by taking off from the Victorville, California runway weighing 1,005,000 pounds (455,860 kg). Its design maximum take-off weight (MTOW) is 975,000 pounds (442,253 kg). The fifth 747-8F joined the flight-test effort with its first flight on February 3, 2011. The 747-8I passenger variant took to the skies over Everett, Washington for the first time on March 20, 2011. The second 747-8I flew on April 26, 2011. Two 747-8I aircraft are to take part in the 747-8I flight test program. 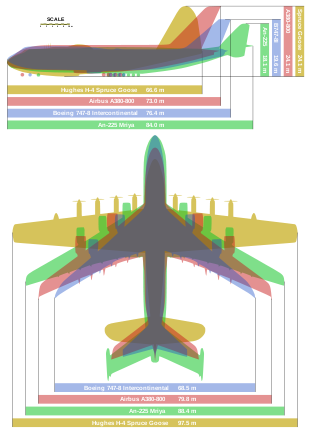 Picture - A size comparison of the 747-8 with other large aircraft; Spruce Goose (gold), Antonov An-225 (green), Airbus A380 (pink), and Boeing 747-8 (blue). The 747-8 is a development of the Boeing 747, which takes advantage of improvements in technology and aerodynamics. The two variants of the 747-8 were launched in 2005. 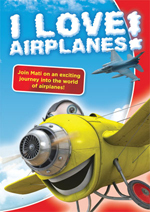 Both feature a fuselage stretch of 18.3 ft (5.6 m) over the 747-400, bringing the total length to 250 ft 2 in (76.25 m). The 747-8 is the world's longest passenger airliner, surpassing the Airbus A340-600 by approximately 3 ft (0.91 m). With a maximum take-off weight of 975,000 lb (442,000 kg), the 747-8 is the heaviest aircraft, commercial or military, manufactured in the United States. Compared to the 747-400, the main technical changes have been on the wings, which have undergone a complete design overhaul. The sweep and basic structure has been kept to contain costs, but the wing is thicker and deeper, with the aerodynamics recalculated. The pressure distribution and bending moments are different, with the new wing for the passenger version holding 64,225 US gal (243,120 L) of jet fuel, and the cargo aircraft 60,925 US gal (230,630 L). The new wing will have single-slotted outboard flaps and double-slotted inboard flaps. Raked wingtips, similar to the ones used on the 777-200LR, 777-300ER, and 787 aircraft, are used on the new 747 variant instead of winglets used on the 747-400. These wingtip structures help reduce the wingtip vortices at the lateral edges of the wings, decreasing wake turbulence and drag, and thereby increasing fuel efficiency. Another effort to reduce weight is the introduction of fly-by-wire technology for the majority of the lateral controls. The extra fuel capacity in the redesigned wing compared to the 747-400 obviates the need to radically change the horizontal tail unit to accommodate auxiliary tanks, further saving costs. 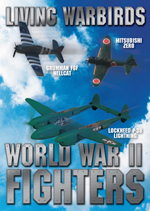 The -8's vertical tail unit is largely unchanged with a height of 63 feet 6 inches (19.35 m). Some carbon fiber-reinforced plastic will be part of the 747-8's airframe to reduce weight. However, structural changes are mostly evolutionary, rather than revolutionary with respect to the 747-400. The General Electric GEnx, which is one of the two powerplant choices currently offered for the Boeing 787, is to be the only engine available for the 747-8. However, the 747 variant has been adapted to provide bleed air for conventional aircraft systems and feature a smaller diameter to fit on the 747 wing. The flight tests of the GEnx 2b engine fitted to a Boeing 747-100 aircraft at the left inner engine began in March 2009. The 747 has proven to be a very popular freighter, carrying around half of the world's air freight as of 2007. In an effort to maintain this dominant position, Boeing designed a freight variant of the 747-8, named the 747-8 Freighter or 747-8F, which was launched on November 14, 2005. The 747-8F will be the initial model to see entry into service (EIS). As on the 747-400F, the upper deck is shorter than passenger models; the 18 feet 3� inches (5.575 m) stretch is just before and just aft of the wing. With a 975,000 lb (442,000 kg) maximum take-off weight, it will have a total payload capability of 308,000 lb (140,000 kg) and a range of 4,390 nmi (8,130 km). Four extra pallet spaces will be created on the main deck, with either two extra containers and two extra pallets, or three extra pallets, on the lower deck. The 747-8F is expected to achieve a 16% lower ton-mile operating cost than the 747-400F and offer a slightly greater range. The 747-8F will have more payload capacity but less range than the current 747-400ERF. When Boeing launched the -400ERF, all of the 35,000 lb (16,000 kg) increase in MTOW over the 747-400F 875,000-910,000 lb (397,000-410,000 kg) allowed airlines to take off with more fuel, burn it during flight, and land at the same weight as the regular 747-400F. This increased the range of the 747-400ERF compared to the 747-400F. Cargo carriers often move machinery or indivisible loads that require a plane with a higher payload and landing capability. As is common with cargo planes, range is given with maximum payload, not fuel. The 747-8's 65,000 lb (29,000 kg) MTOW increase has been directed exclusively to its Zero-Fuel weight or payload capacity. If taking off at maximum payload, the 747-8 takes off with its tanks not full. 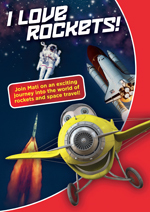 On trips where the payload is not at maximum, the plane can take on more fuel and extend its range. Cargolux and Nippon Cargo Airlines were the first customers for the 747-8, placing orders for the freighter variant in November 2005. The firm configuration of the aircraft was finalized in October 2006. 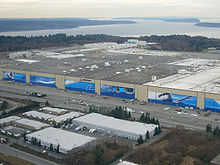 Major assembly of the aircraft began on August 8, 2008, and the aircraft first left Boeing's Everett factory on November 12, 2009. The passenger version, named 747-8 Intercontinental or 747-8I was launched on November 14, 2005. The aircraft will be capable of carrying up to 467 passengers in a 3-class configuration over 8,000 nmi (15,000 km) at Mach 0.855. The 747-8I will carry 51 more passengers and two more freight pallets with 26% more cargo volume than the 747-400. Despite initial plans for a shorter stretch than the freighter model, the two variants will be the same length, increasing passenger capacity and allowing easier modification of the 747-8I to freighter use. The upper deck will be lengthened on the -8I. New engine technology and aerodynamic modifications will allow longer range. Boeing has stated that compared to the 747-400, the -8I will be 30% quieter, 16% more fuel-efficient, and have 13% lower seat-mile costs with nearly the same cost per trip. For the 747-8, Boeing has proposed some changes to the interior layout of the aircraft. Most noticeable will be the curved stairway to the upper deck and a more spacious main passenger entrance. 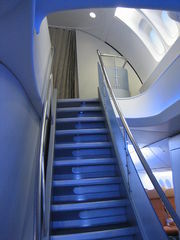 The 747-8's main cabin uses an interior similar to that of the 787. Overhead bins are curved, and the center row is designed to look as though it is attached to the curved ceiling, rather than integrated into the ceiling's curve like on the 777. The windows will also be of similar size to the type used on the 777, which are 8% larger than those on the current 747-400s. The 747-8 will feature a new solid-state light-emitting diode (LED) lighting system, which can create mood lighting. LED technology also offers improved reliability and lower maintenance costs. Further down the aircraft, it has been proposed to place cabin-accessible facilities in the "crown" area, the space above the passenger cabin, currently used for air-conditioning ducts and wiring. The wiring and ducts will be moved to the side to create extra space; as a consequence, this area will not have windows. The added space can be used for galleys and crew rest areas, freeing up main deck space for additional passenger seating. During the initial 747-8 marketing phase, Boeing also proposed creating a revenue-generating "SkyLoft" passenger facility in the crown space. This facility would include "SkySuites", small individual compartments with sliding doors or curtains, featuring beds, seating, and entertainment or business equipment. A common lounge area could also be provided. Boeing also proposed smaller, more modest "SkyBunks". Access to the crown area would be via a separate stairway at the rear of the aircraft. Passengers using the SkySuites, sold at a premium price, would sit in regular economy class seats for take-off and landing, and move to the crown area during flight. However, pricing feasibility studies found the SkyLoft concept difficult to justify. In 2007, Boeing dropped the SkyLoft concept in favor of upper-deck galley storage options, which were favored by the airlines. Outfitting the crown space for sleeping remains an option on VIP aircraft. The first order for the 747-8 Intercontinental was placed by an undisclosed VIP customer in May 2006, widely believed to be a Middle Eastern head of state. Lufthansa became the first airline to order the 747-8 Intercontinental on December 6, 2006. In December 2009, Korean Air announced the order of five 747-8Is. Boeing stated firm configuration for the -8I was reached in November 2007. Major assembly of the 747-8I began on May 8, 2010. The final body join occurred on October 15, 2010, slightly ahead of the projected schedule. Assembly of first 747-8I was completed in February 2011, before being unveiled at a rollout ceremony in Everett, Washington on February 13, 2011. Deliveries are to begin in late 2011. On March 7, 2011, it was announced that Air China had agreed to purchase five 747-8Is, subject to government approval, at a price of $1.54 billion. Air China said it would use the aircraft to increase international service. Gauntlet ground testing of the -8I, which tests systems by simulating flight conditions, took place on March 12 and 13, 2011. The 747-8I's first flight occurred on March 20, 2011 from Paine Field in Everett, Washington. The second 747-8I first flew the following month. The U.S. Air Force is seeking to upgrade Air Force One by replacing the Boeing VC-25 (two heavily modified 747-200Bs). Boeing is reported to be exploring a 747-8 proposal, along with a Boeing 787 Dreamliner variant. In 2010, South Korea government sources indicated that the country was considering purchasing the 747-8 to serve as the country's presidential aircraft. The freighter version of the 747-8 has attracted orders from several cargo airlines; the plane has the benefit of similar training and interchangeable parts with the Boeing 747-400F. In addition, the 747 has a long history as a successful cargo aircraft, and despite its age is still popular among operators, as it has a larger cargo capacity and a longer range than other freight aircraft. Compared to the freighter version, the passenger version of the 747-8 has not seen as much success, with far fewer orders. Airlines including Emirates and British Airways considered ordering the 747-8 Intercontinental, but opted to purchase the Airbus A380 instead. In addition, there are 8 VIP orders for the 747-8I by various customers. Boeing Chairman and Chief Executive Jim McNerney acknowledged in a conference call to Boeing's investors on April 23, 2008 that he would like to see more orders for the passenger version of the 747-8.